Green Party councillor and campaigner Keith Kondakor has obtained previously secret Nuneaton surface water flood risk maps using Freedom of Information regulations. The maps show areas that may be flooded by over 30cm (one foot) of floodwater due to surface water. Areas at risk include sites of potential new housing as well as existing homes. 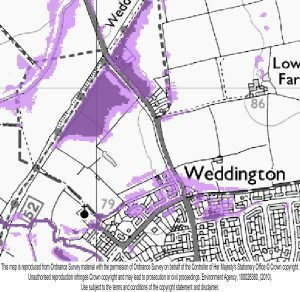 Flood defences, balancing ponds and sustainable drainage systems will be needed to reduce the flood risks in areas highlighted in purple on the maps but care will also be needed to reduce surface water runoff into the areas at risk. For the Weddington fields development site a large part of the West side could be flooded by over a foot of water. I am very angry that this map was not provided to campaigners at the time of the Weddington planning inquiry. Ahead of the release of the currently secret borough plan the developers seem to be targeting the areas of highest flood risk. It is immoral to increase surface water flood risks when the local authority has a map of which areas need special care. 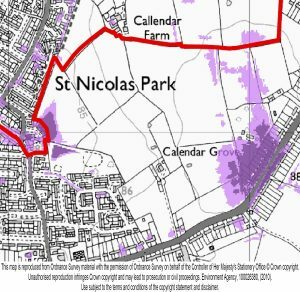 I have uploaded the detailed maps for Weddington and St Nicolas ward. This can be reproduced as long as the copyright/licence information is not cut off. Previous Previous post: latest email – only labour & Tories matter!